XNU source code of El Capitan soon to be released? When you visit http://www.opensource.apple.com then you quickly realise that the XNU source code bits for El Capitan are yet to be released, but something tells me that it won’t take long anymore. Edit: Nope. It took Apple weeks before they released it. Presumably due to code cleanups and possible security related issues, because if you look at the released XNU source code then you’ll see that this is not the code that we are using. Thanks anyway Apple. Apple is pulling a trick on us because AppleIntelSKLGraphicsFramebuffer.kext in El Capitan OS X 10.11.1 (Build 15B42) is not the one for Skylake. Why else is Apple checking for Broadwell ID’s? Come on Apple. What the heck is this? We also learned previously that the frame buffer data is there already so this is still all a bit contradicting. Just to let you know, and it is a bit of a surprise move from GigaByte… but they now set bit-15 on MSR (MSR_PKG_CST_CONFIG_CONTROL) so it won’t boot without a PM patch. Sorry folks. 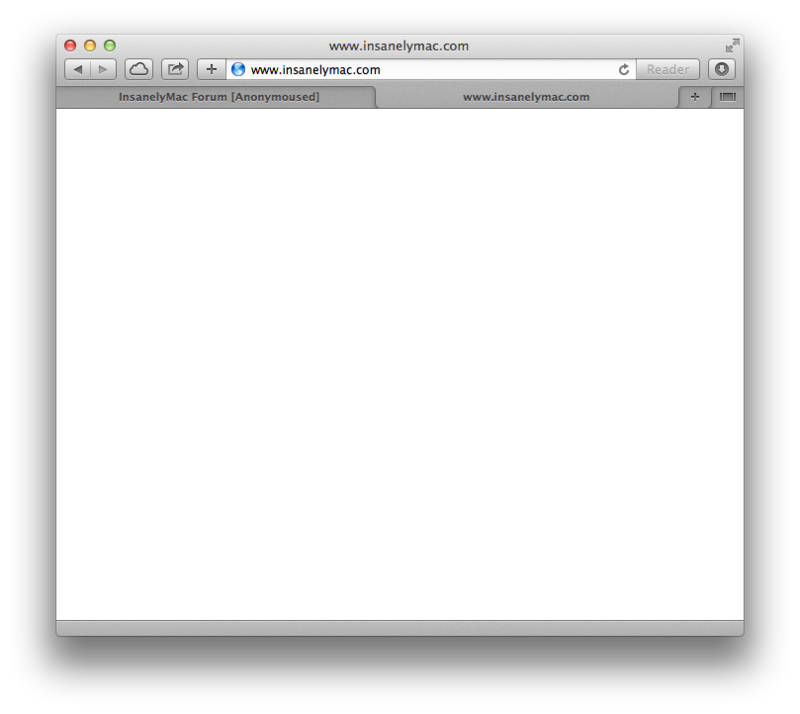 Something, or someone, has made it impossible for me to visit insanelymac.com because this is all I get to see. Note that when I use a different server – see first tab – then the page shows up, so obviously someone/something don’t want me to visit the site anymore. Well. That’s too bad… for you all. Later! Update: Hola! I also cannot visit any other Hackintosh related website. That sound suspiciously like… ehm. No idea really. I compiled the IOGraphicsFamily.kext yesterday and added debug output to located the root cause of missing and deformed Apple logos during the first, second and third boot stages, and I think to have located the problem. I’m now working on a solution without adding workarounds like patching the kext to simulate verbose boot ups et all. However. I am still very busy with something else so you will need to wait for me having the time for it. Will report back as soon as I have more news for you. Hopefully sometime next week. Edit: iMac16,x model/board-id’s removed (Broadwell models). Edit: Apple apparently started to use _CSS and _PSS instead of the previously used Apple specific ACSS and APSS. About time. Note: The Intel i5 (1,6HGz, 2.8GHz and 3.1GHz) are Broadwell based. Update I renamed AppleIntelFramebufferAzul.sh to AppleIntelGraphicsFramebuffer.sh and added support for the Intel Skylake processor graphics – new version soon the be released – and here is some of the output. Edit: The IOPCIPrimaryMatch list in AppleIntelSKLGraphicsFramebuffer.kext/C*/Info.plist does not include 0x191b. None of these will work so there is no point of using them. Also note that 0x19120001 is used twice and I changed the second one into 0x19120003 and used it during my test runs, but whatever I did, my monitor always showed up on port 6. I can change the port number, and all the rest of the values, but I can’t seem to change the third port without breaking stuff. Pretty weird.